Even for the most skilled decorative concrete contractors, a big job can become a trial-and-error process and an opportunity to learn something new. 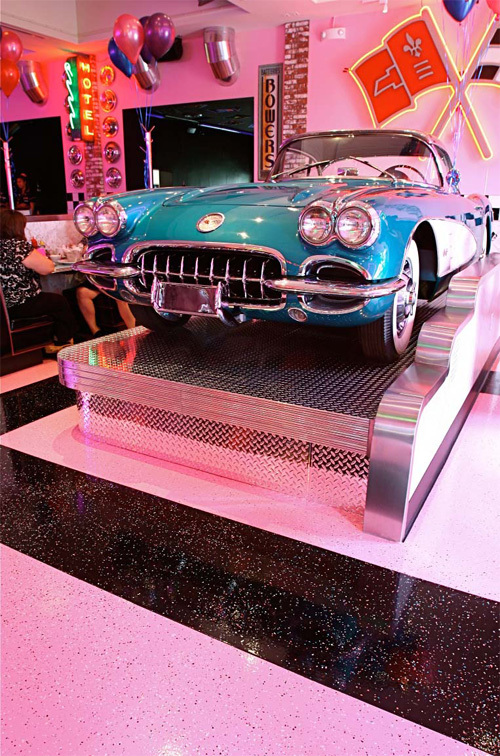 At the Corvette Diner in San Diego, where Life Deck Coating Installations put in vibrant floors to match the restaurant's '50s vibe, a lesson was learned that other contractors can take note of: In a busy restaurant where floors endure abuse, a matte finish is a better bet than a glossy one. The Corvette Diner job involved the application of epoxy that shows off checkerboard, curve and circle patterns in black, white, bubblegum pink and turquoise. Life Deck Coating Installations workers finished with a high-gloss topcoat for extra sheen. The result was a surface that's fun and playful, similar to the atmosphere of the restaurant, where waitresses wear bouffant hairdos and poodle skirts, the burgers and shakes are monster-sized and oldies blare from the jukebox. But approximately one year after the floors were finished, their gloss had slightly dulled and minor scratches began to appear due to a high amount of foot traffic and rough contact with tables and chairs. The solution? Even out the surface with a satin sealer that's less likely to show signs of abuse. Life Deck Coating Installations workers recently went back in to refinish the restaurant's most popular spot - the party room - with the new sealer as a test run. So far, it's proved to be a sturdier choice. "We had applied high-gloss finishes in restaurants before, but this particular one seemed to have dulled faster, " says Life Deck project manager Gil Koury. "It's always a good idea to possibly think of using a satin finish for the floor of a high-volume restaurant. " The entire journey began back in spring 2009, when Life Deck began the original floor installation for restaurant owner Cohn Restaurant Group. Using products from specialty coating systems manufacturer Westcoat Specialty Coating Systems (which, like Life Deck, is owned by Pacific Pebble Corp.), workers covered about 80 percent of the restaurant's floors with unique designs in shimmering colors. Crews worked on the diner's bathroom floor, arcade room floor and several themed-room floors, varying patterns from room to room. One room's floor is covered with a pink and white checkerboard pattern, and a custom fleck design was placed to spice up the squares. In a walkway, a long curved line separates solid sections of pink and black and leads to a large white circle. Koury and his workers completed the floor over the course of three to four months. First they smoothed out the uneven surface with Westcoat EC-72 Epoxy Patch Gel. Then they installed Westcoat's Epoxy Slurry System to add a strong, even layer to the floor. 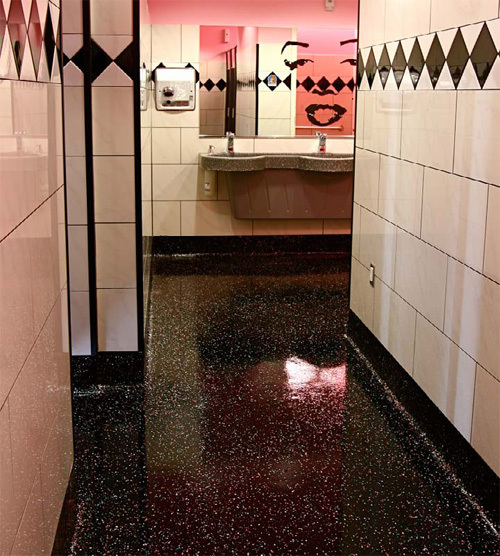 They saw-cut patterns into the floor, Koury says, and colored the patterns with Westcoat EC-34 epoxies in black, white and a custom-blended pink, along with acrylic paint chips in black, white, pink and turquoise. They finished with two topcoats - EC-31 Epoxy Clear and EC-95 Clear Polyurethane - to protect the floor and give it sheen. Koury worked with hospitality and restaurant design company Design Perspectives to develop the patterns and colors. "It's a '50s diner, so we were for sure going for a '50s feel to it, " he says. "It's very dramatic. The way it looks with the color combinations and the way it was designed is definitely unique." Cohn Restaurant Group president and founder David Cohn says the floor's design evokes personality, just as his restaurant does. "The Corvette Diner was designed to create a fun, lively dining environment that featured the colors, patterns and vibe of the 1950s. The floors were brought to life with a palette of pink, black and white with a variety of patterns, including checkerboards and playful curves that complemented the surrounding theme." In early 2010, when minor scratches and dulling became visible, Life Deck launched the refinishing plan. "It didn't look bad - it had just dulled a bit because of all the traffic in the restaurant, " Koury says. "One room had a lot of tables and chairs in it that were being moved, and there was some scratching, so we applied a satin polyurethane finish." The restaurant closed for a few days while Life Deck employees got to work on the party room, which comprises about 10 percent of the entire restaurant's floor surface. First, they sanded the surface with 50-grit sandpaper and wiped it down with a solvent. Then they applied two coats of Westcoat's low-odor, low-VOC polyurethane satin sealer, SC-66. The floor's design hasn't changed, and the only visible difference from the first go-around is slightly less sheen. Since scratches are easier to see on glossy surfaces, a more-matte finish was just what the floors needed. "The satin finish shows fewer scratches and holds up better, " Koury says. "It just has more of an even look versus a high-gloss." So far, the new finish has been scratch-resistant, and Life Deck Coating Installations may refinish the remainder of the restaurant's floors at a later date. 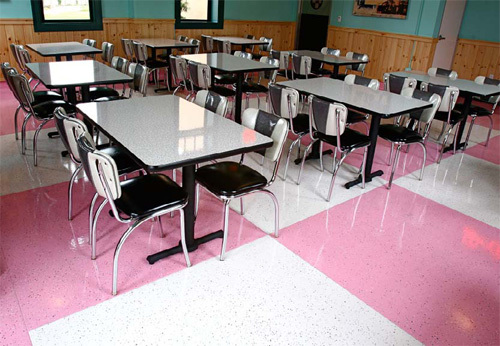 Most importantly, this minor setback never kept compliments on the floor from rolling in, and the Corvette Diner team has been consistently pleased with the contractor's hard work. "Our customers often comment on the unique floor designs as they walk to their tables, " Cohn says. "We feel that the Life Deck floor is a great compliment to our overall design and concept, and we enjoyed working with their professional team. " Terry Keener Jr. of TNT Resurfacing Concrete in Lodi, California, helped oversee the decorative transition of a children’s hair salon in Chico, California. When he started the job, the salon’s existing 1,900-square-foot floor was vinyl composite tile. The BoHouse Café in Dubai gives off an artsy vibe with its eclectic crowd and creative dishes, and the restaurant's decor is right in line. On the café's ground floor, swirling rainbow stripes, sparkling clouds and colorful disks and hearts pop against a radiant white background.